So this is part of the 3rd Mazdaspeed kit I've obtained. It's just been sitting in the garage, in case I'd ever need replacement parts, but I'm deciding I can use the value towards something more beneficial and am willing to let go of the front and rear bumpers if the price is right. Both bumpers were bought brand new, in sunlight silver. I had them painted titanium gray and installed on my 2nd Rx8 which they were used on for less than a year. I then bought a new car and kept these when I sold the gray one. Paint is not perfect, but the pieces themselves are. Front comes with all original mounting hardware, screens and ducts in perfect condition, never been sawed at. Rear also comes with all original hardware in perfect condition, and includes the stock OEM rear bumper that it's mounted to. Out of all the MS parts I've acquired, this front and rear are by far in the best condition - like new. I even have the original installation instruction booklets that came with them. Asking $2700 obo for the set, and trying to not have to ship these. I have shipped an authentic ms front before, so if worse comes to worse I'll do it again. Post or PM with interest, thanks. I guess I'll try and sell these again. 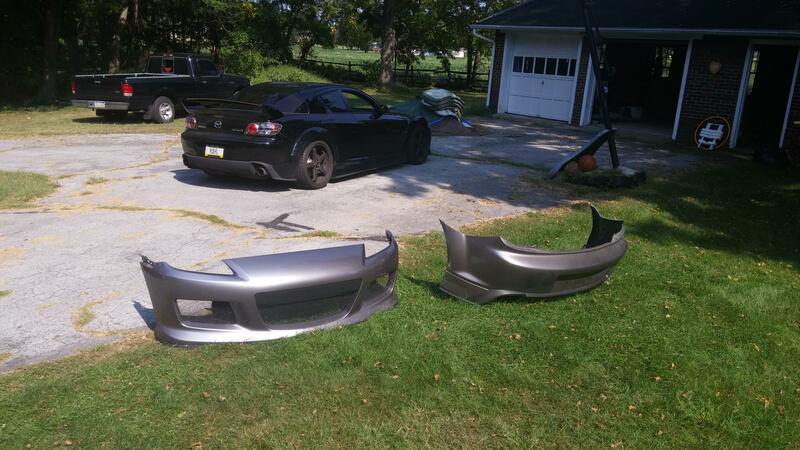 Also have authentic Mazdaspeed wing and Seibon KS-style carbon fiber hood (painted). The whole kit looks phenomenal together. Only thing that's missing is sideskirts. Last edited by Kahl; 09-18-2016 at 11:01 AM. I am interested in the front mazda speed bumper. Sent ya a PM a few days ago seeing if it was still available. Is the front bumper still for sale? #1 welcome back, been a while. A lot of prices have dropped off. I've seen MS wings in amazing shape for 600+, if a little rough, less. CF hood in decent shape 250-350 great shape 450-600. Their are some listed higher but they don't sell often. Bottom line is you can list it for whatever you like. But if your looking to sell things quickly, be realistic and drop the price a bit. I'm not saying it won't sell at a higher price. I'm simply saying at those prices your buyer pool is limited. Again, nice to see you back. Does the front bumper have damage? I see a crack on the bottom passenger side. I wouldn't mind stocking up on another MS bumper. You need to add the prices. I've given you a couple days. You have to add them or I will be required to close the thread. 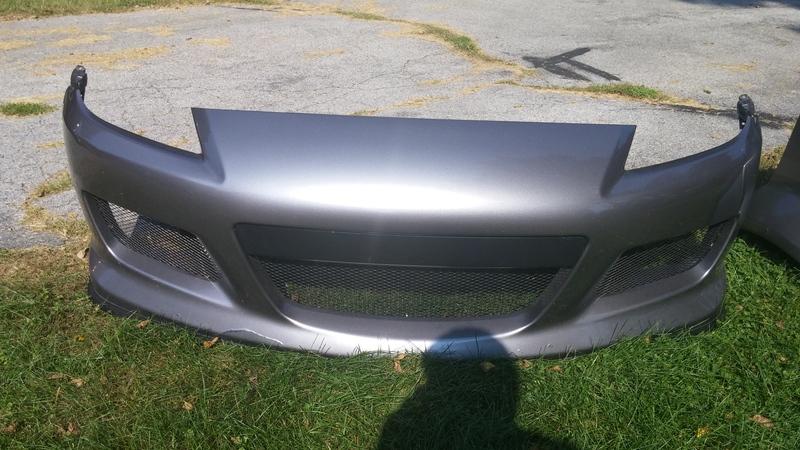 The font bumper has no damage, I bought this bumper brand new in sunlight silver and had it repainted titanium gray. The spot you see is where tigray paint did not adhere well and peeled backed. Ideally I'd like to sell the whole kit at once and am willing to give a sizable discount if someone is interested in everything. I also really don't want to ship these. Mazdaspeed Front Bumper + Mazdaspeed rear under diffuser installed on oem rear bumper + Mazdaspeed wing + Seibon CF hood all for around $3k picked up How's that sound? Last edited by Kahl; 09-27-2016 at 04:56 PM. Yeah, let me know if you're willing to ship, i'll take both. I've shipped many bumpers via greyhound which worked perfectly fine. I still have a Seibon KS style carbon fiber hood (painted) available.